Leonov’s paintings are fantasies, or what he terms “inventions.” They are large, colorful works painted on unstretched, roughly cut canvases that depict idealized scenes of people, nature and town life. The images within the paintings are neatly compartmentalized into sections Leonov calls “rooms” or “television sets,” that reflect his obsession with order. By combining images of historical events (scenes of famous battles) and Russian cultural icons (the poets Pushkin and Esenin) with present day landscapes, Leonov’s paintings collapse time and reality. Leonov often transplants images from his travels or from passages in books to embellish the remote landscapes of his surroundings. The hard life Leonov has lived gives way to an orderly, peaceful never-never land, where elements from old and new harmoniously mix. 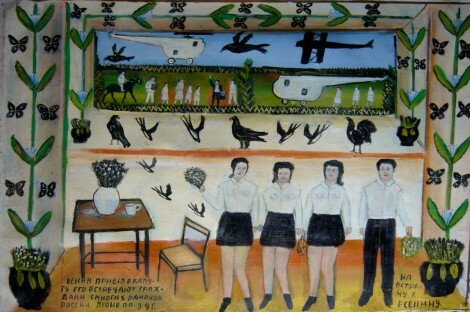 Animals dance, while birds and helicopters fly overhead; an audience visits Leonov’s studio and commends him for his beautiful paintings, while a group of peasants listens to a famous poet speak. Leonov’s fellow villagers sometimes made fun of his artwork and his “fanciful” stories, but the paintings were his chance to pursue his dreams, yet are universal enough to allow us to enjoy those fantasies for ourselves.